Our full length Bungee Run is 33ft long. This is a fun game to play and two people can play at one time and there is plenty of room for spectators! 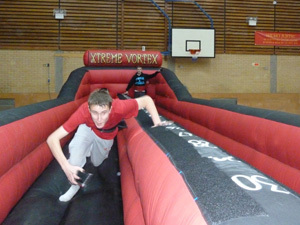 The traditional idea of Bungee Run is to run down the gauntlet as far as possible and place your baton as far away as possible in the marker zone before the bungee strap attached to you pulls you back.Not only does our Bungee run provide the traditional fun you would expect but it also has Basketball nets at the end of the gauntlet to provide a twist on the classic game. Run down the gauntlet as fast as you can, this time with a Basketball! Shoot and score all in the short time before the bungee strap attached to you pulls you back! 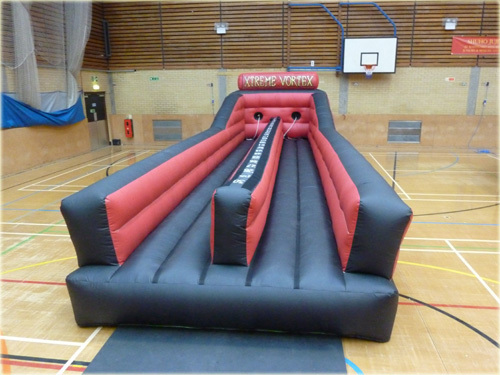 We always provide a member of staff to run our Inflatable Bungee Run Basketball to ensure the activity is run smoothly and safely for your event. Our staff are fully trained, enhanced CRB checked and first aid trained.